If I were to add Massive Raid , should I replace Roar of the Crowd or Incinerate ? 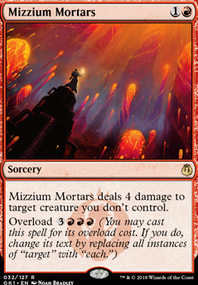 If you really want instants, stuff like Magma Jet , Incinerate or Skullcrack offer some useful side effects. 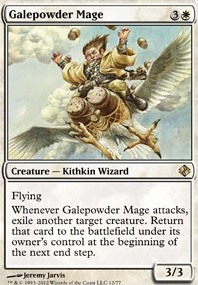 You could also sideboard Smash to Smithereens . Enigma Drake might be too slow, of course, and your 1.70 average CMC makes a good point. 1) planeswalkers aren't creatures. thats why they can't have creature types. 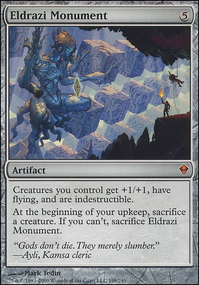 2) planeswalkers now follow the same legendary rule as creatures and have gained the legendary supertype. 3) planeswalkers have always had more than one ability until the "war of the spark" set, which hasn't been released yet and only walkers printed at uncommon have only one ability. 4) he never said farmer "can't" be a creature type, only that it is currently not one. 7) now i gotta ask Funkydiscogod why elf/vampire is "invalid". i've never heard of elves being immune to vampirism. its completely possible in "Dungeons & Dragons", another game made by WOTC. 9) Funkydiscogod: wotc may have stated they're not printing more cards with regeneration, but this guy probably doesn't work for wotc. cards with regeneration are still legal in tournaments. 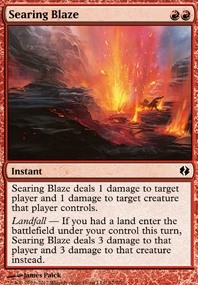 wotc only stopped making more because it was "too confusing" for new players. 10) "burn" definitely does not need to be a subtype. it does not open up any possibilities we don't already have. 11) a restriction is literally the opposite of flexibility. but as for your "gleeful pyre", the game already has a bunch of burn spells with that same effect (minus "build 8" of course) or even better. see Lightning Bolt , Incinerate , Lightning Strike , Searing Spear . all of them deal 3 damage to any target, at instant speed for 2 mana, with no restrictions or downside. furthermore, i kinda doubt you "remember" any of that stuff. Hello, once more I have found more potent cards: Incinerate and Pyretic Ritual and finally the best card Lotus Bloom . for the sake of making the deck list easier to read, use the same printing for all cards of the same name. for example, your Shock 's. it essentially shows up in the list twice, once as the m19 printing and the other as the Aether Revolt printing. i would also highly recommend doing some research on the top modern decks. there are cards in this deck that are strictly worse than some other cards available in the format. again, Shock is an example. 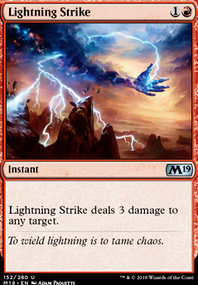 Lightning Bolt is the best burn spell in the format. 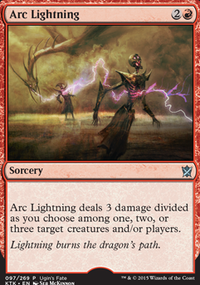 Lightning Strike can upgrade to Incinerate , and the counterspells could be upgraded to Mana Leak and Remand . Ionize is also a good option. 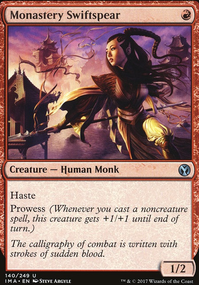 Adeliz, the Cinder Wind is only good in a deck whose creatures are solely wizards. otherwise you'd be better off running Wee Dragonauts . 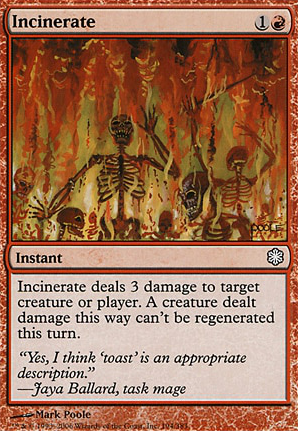 Personally, I would just remove as many instants and sorceries as possible. I would keep the removal ones, but the cards like Fortuitous Find , Scouring Sands , Warp World , Grave Birthing , Expedite , Incinerate , Lightning Bolt , and Lightning Strike aren't very strong for a creature-based commander. Burn spells just can't kill the threats present in commander, and cheap cantrips aren't necessary because your commander itself is a cantrip once you get enough creatures into your deck. 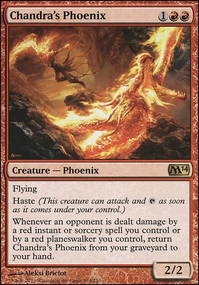 I know it's tempting to get instants and sorceries back that Grenzo chucks into the graveyard, but outside of Past in Flames , I would try to keep the deck more focused towards creatures. It's better to make better use of Grenzo's ability to cheat in creatures then try to shore up his weakness of whiffing on other spells.